That may sound old-fashioned, but with the number of activities that we have going on at Camp Sabra, we want to make sure that our campers have the food fuel to make it through the day. We serve our campers three well-balanced meals (and snacks!) each day with plenty of options to accommodate all of our campers’ tastes and dietary needs. All food is prepared on site. Even our bread is baked in our kitchen daily. 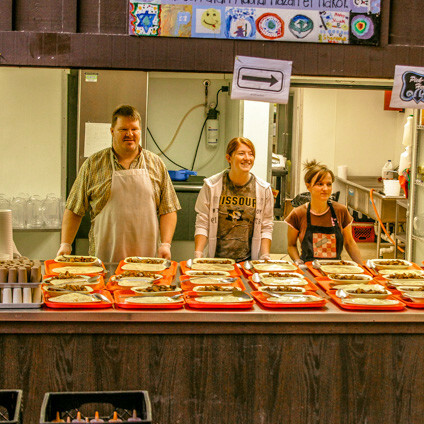 Camp Sabra serves Kosher food which is peanut, tree nut and sesame seed free. For more details or for information regarding other allergies or dietary issues, please contact our Camp Director. 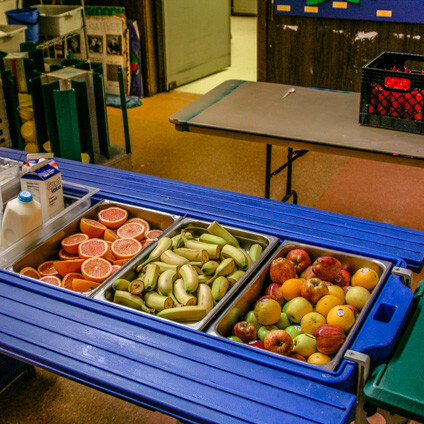 Our food service provider makes sure that our campers have a hot option every day for breakfast, along with choices of cereal, fruit and yogurt bars. For lunch and dinner, campers have the options of a hot entrée and a salad bar complete with plenty of leafy and colorful vegetables, proteins (including soynut butter or hummus), cottage cheese, etc. All meals include a vegetarian option. All campers receive two snacks a day, and older campers also receive an evening snack. If your camper doesn’t find something to eat among our options, our counselors will work with them to make sure that they are getting the nutrition they need. Meals are a special time at Camp Sabra. We all sit down together to eat, and then we show our Ruach with cheering and song sessions. Seeing out kids interact together, the oldest and the youngest coming together, is a great demonstration of what exactly camp is all about!